I received these Japanese sponges as a gift a few weeks ago and thought they were too nice to use for cleaning. I thought about incorporating them in a project as the faces are embroidered and it is not what you would expect for something that it supposed to help you clean the grime. 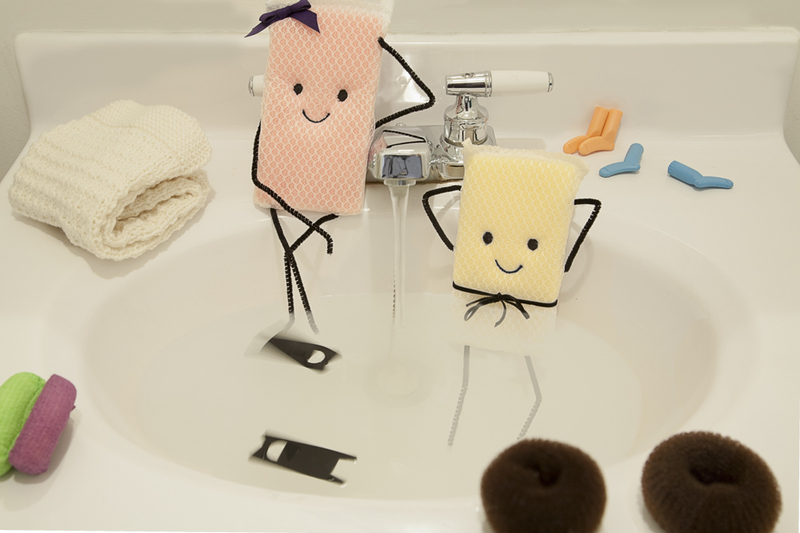 I decided to do a little set-up in my bathroom, because this is were you usually see sponges, but not in that manner. I added limbs and ribbons to make them more like little people and pretended that it was a poolside snapshot after a hard day’s work (hence the almost spotless sink). I did a composite of two pictures, one with the sponges, the other with water and did more work in Photoshop than I ever did in my life. I know it’s not perfect, but I am quite proud of the result, considering my lack of experience.